During Germany’s biggest trade fair with accompanying congress for cinema operators, the “KINO” in Karlsruhe, the whole cinema industry gets together to get informed about trends and novelties of the national as well as the international cinema industry. Realized for the first time in 1971, the trade fair will switch places in 2016 from Baden Baden to Karlsruhe. 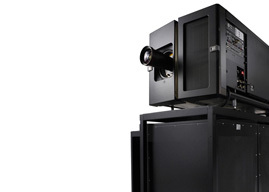 Cinema technology – from digital projectors and audio systems to screen and 3D technology – will be presented in the convention centre of Karlsruhe. Added to this is the cinema equipment, such as the seating, counter and till systems, convenience products and even software for cinema operators, amongst others of the sectors of DCP and KDM management, of online ticketing and internet applications. The trade fair is accompanied by an extensive congress programme, which consists of seminars and workshops in cooperation with the experts of the sector, who give lectures on subjects like technological tendencies or the sponsorship of cinemas and even on staff motivation and management succession. Nearly all the big firms for film distribution present their current offers in the course of tradeshows. A get-together for the industry completes the event. The KINO will take place on 3 days from Tuesday, 09. May to Thursday, 11. May 2017 in Karlsruhe.